borrowing stuff brings with it an unwritten sense of responsibility. not only is it dutiful to return said stuff in the same working order that it was received, but i feel honour bound to make sure that whatever we happen to be talking about is appropriately clean. in this particular case, i make reference to bicycles kindly sent for a few weeks' holiday on islay, during which they can be thrashed within an inch of their lives (just kidding), photographed in all sorts of embarrassing positions and locations and treated as if they belong to someone else. but as with most holidays, these joyous times must someday come to an end, which is where the real work starts. assembling a bicycle, should that be necessary, is, if i'm honest, rather fun. there is great joy to be had watching a bicycle take shape before your very eyes, appearing as if by magic and a park multi tool. disassembling is more of a chore than a joy, partly because the bicycle is about to be returned in the cardboard box of its arrival, and because all that yuk i obliviously ignored while riding in the rain now has to be painstakingly removed. i would hang my head in shame if i returned a bicycle in a less than pristine state. like many of you, i have seen the short documentaries on tv as well as on youtube portraying the work of professional team mechanics, and mostly, they use soap, water and the occasional pressure washer. i do not own or have access to one of the latter devices which is probably a good thing; i fear i would be a danger to life, limb and small animals. however, soap and water is not a problem. but, there are a number of folks willing to aid and abet the basics by proffering sponges, cloths and sprays to lessen the level of elbow grease required, one of which is simon nash of the green oil company. it seems a touch unnecessary to mention that simon's products are environmentally sound, making them less dangerous to those aforementioned small animals than yours truly in charge of a pressure washer. 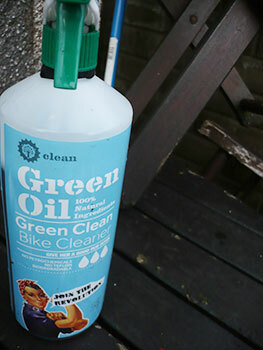 first things first, and prior to applying any water to a mucky bicycle frame, spraying green clean from its one litre bottle allows for a loosening of the agricultural crud that is feature not a bug of living on the inner hebrides. had i been astute enough to remove the crap at point of origination i'm sure the green clean could have remained sleeping in its wash bucket, but that is, of course, purely hypothetical. 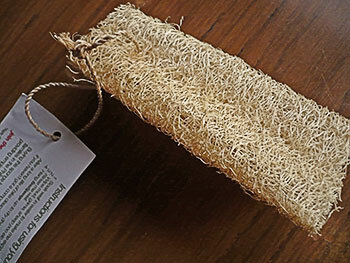 ever inventive, the green oil folks have thought of pretty darned near everything, providing an eco sponge made from the luffa plant. in its natural state, the sponge would likely remove paint along with any accrued crud, but a brief soaking in warm water turns it into a big softy, ready, willing and able to wash stuff. resembling a skinny version of a shredded wheat, i think i like the idea slightly more than i enjoyed its cleaning abilities. 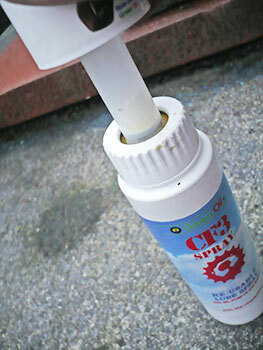 don't misunderstand; the eco sponge cleans the nooks and crannies, but its very open weave has an irritating tendency to catch on cables, chainring teeth, bottle cage bolts and one or two other protruberences peppered about the frame. perhaps there's a knack i have yet to acquire. when its life of scrubbing is over (about a year of normal use), tis but a simple matter of composting the item or burying it in the garden. some of that crud, left to its own devices takes on the properties of reinforced concrete, and is often about as easy to remove. reinforced concrete would give that poor little luffa sponge something of a scary fright. 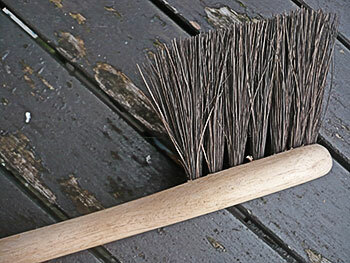 happily, contained within an eco rider deluxe set or available on its own, is a sustainably sourced wood-handled bicycle brush with plant based bristles that simply laughs in the face of reinforced concrete. and, if you're not careful, sprays your jacket with lots of water. during the grand tours, it is frequently possible to watch motorbike camaramen hanging dangerously close to the rear hubs of speeding domestiques and team leaders. pay particularly close attention, next time you're watching, to the sheen catching the sunlight on each link of those ten or eleven-speed chains. that's precisely how i expect my chains to look, but they rarely do, having been placed in closer proximity to the crud that has already been described as magnetically attached to the frame. 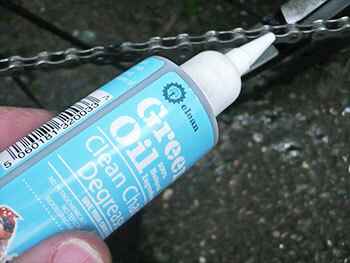 lubricating the chain at this point will simply compound the problem, adding greatly to the rate of wear and likely necessitating a new one sooner rather than later. and i surely need not point out that a worn chain is not doing that expensive cassette any good in the process. 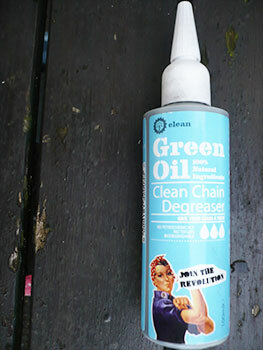 pragmatism dictates that the chain ought to be rid of its grit and previous oiling before adding a new coating, and for this, green oil offer a small tube of chain degreaser. this is applied in similar manner to that of applying the green oil (which we'll get to in the next stage, as they'd say on blue peter). after working this through the system, so to speak, by clicking up and down the gears for a couple of minutes, rubbing with a cloth before rinsing off with water presents a shiny chain just like the ones you can see on the telly. professionalism in a bottle. this stuff works a treat. 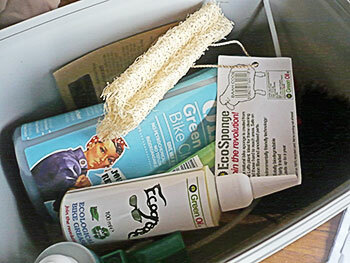 as advised on more than a singular previous occasion, i am a less than tidy and organised person, so prior to preparing for the bicycle clean outlined above i took the lid off my eco deluxe set and emptied the contents over the bike shed floor. in the process of accounting for everything, i came acros a small brown enevelope which, on closer inspection offered up a clever little treat. while the majority of products and containers used by the green oil company are recyclable, it turns out that the plastic tub (useable as a wash bucket) actually isn't. not to be defeated, mr nash has provided a packet of rocket seeds to be stored in a safe place until the bucket has reached the end of its serviceable life. at that point, poking a few holes in the base and sitting it on top of the lid, allows its continued use as a tub for growing rocket salad. how utterly cool is that? though i've based this narrative around my returning of borrowed bicycles, it is undeniably true that the forthcoming months are not the most bicycle friendly. considering what the bike does for me, i'm more than happy to spend as long as it takes to make sure it continues to do so for as long as humanly possible. the fact that all the above, as well as some green oil eco grease and the previously reviewed dry wax lube can be acquired as a complete set encased in a future plant tub seems something of a no-brainer to employ the vernacular. surely the bike is worth spending a mere £34.95 on?